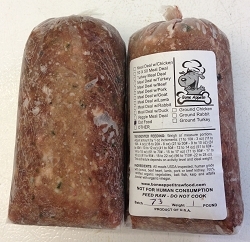 Bone Appetit's Raw Cat Food consists of 100% hormone & antibiotic free turkey necks, canard ducks, organic vegetable mixture, pork kidney, beef liver, and pork heart, fresh bait fish, organic kelp, alfalfa, and vinegar, and made into a very fine grind. The ratio is approximately 39% hormone & antibiotic free turkey necks, 39% duck, 3% organic vegetable mixture, 11% offal, 8% fresh bait fish and 1% alfalfa/kelp & vinegar. This meal is designed for cats. This meal gives the proper nutrients that cats need. Cats need liver in their meal because they need tureen. Also, cats crave more fish that have both Omega 3s and 6s. We only ship this product by the case. Each case contains 24, 1 pound tubes. Due to its perishable nature, we only ship on Mondays for orders placed before noon the prior Tuesday and we only ship to the West Coast (mostly Oregon, California, and WashingtonÃ¢€Â¦). If youÃ¢€â„¢re outside of Oregon, California, and Washington, please call us to see if we can accommodate you.